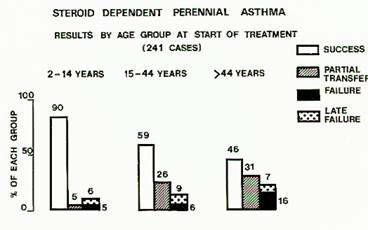 Today it is taken for granted that asthma is treated with inhaled steroids, and nowadays very few asthmatics are dependent on oral steroids. Some account of the early days of the first trials may be of interest, as this was a very exciting time leading the world in the treatment of asthma and rhinitis. These open trials would never have been accepted for publication nowadays, but the results, especially in children, were so obvious that double blind trials would really have been unnecessary and unethical. Although Becotide and other inhaled steroids have had a tremendous impact on the treatment of asthma affecting both children and adults, I feel that the very effectiveness of this therapy has made it less important to find out the causes of asthma or rhinitis. Today the diagnosis of asthma or rhinitis is almost invariably followed by the prescription of inhaled steroids, and very seldom by any effort or tests to define the cause. 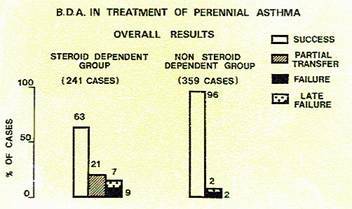 From 1958 to 1971 I had directed my main research efforts towards Aerobiology, which involves the capture, identification, and counting of the pollens and spores which cause seasonal hay fever and asthma, and with effective desensitisation which is actually curative treatment. In fact my rescue of Becotide made it unnecessary for the doctor to know the cause of his patient’s problem in most cases of respiratory or nasal allergy, and rendered my aerobiology research much less important. 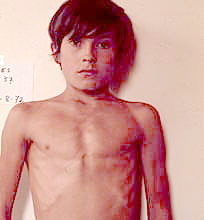 Before 1970 gross chest deformities in children were not uncommon, and photographs were taken before and at intervals after the introduction of Becotide show their disappearance. In adults dependent on oral steroids, the photographs show the remarkable changes in their facial appearance and obesity after transfer to inhaled steroids. A selection of unpublished pictures and peak flow charts showing dramatic improvements are shown here as a matter of historical interest. 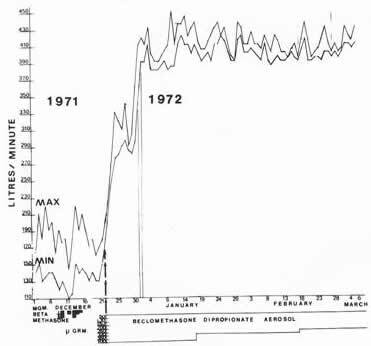 It was finally decided to try her on Becotide at the end of 1971, and her peak flow stabilised at once. She is now 48 and still maintained on Becotide. Serial photographs were taken over the next few years, as shown below. 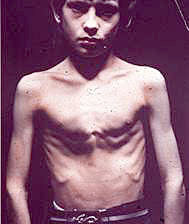 This boy aged 14 had developed a chest deformity from chronic asthma. After a year on Becotide with complete control of his asthma, and being able to take normal exercise and sport for the first time the shape of the chest has become normal. John was only two and a half when the photo on the left was taken. 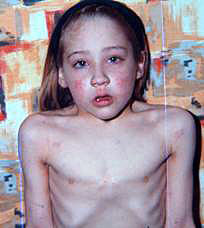 He had been treated elsewhere with oral steroids for some time, with obvious side-effects and retardation of growth. I doubted if we could get him to use an inhaler at his age, but with his mother’s persistence he learnt to use an inhaler properly. 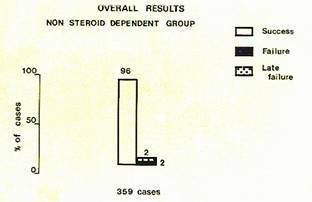 Oral steroids were stopped and he did very well as shown by the second picture taken only a year later showing rapid growth and disappearance of the steroid side-effects. 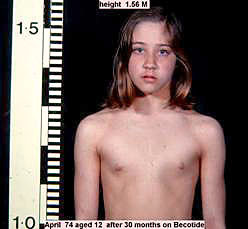 He developed normally into a healthy young man, except for the asthma for which he still has to take Becotide daily. He has been a game keeper for some years and is now aged thirty-six. 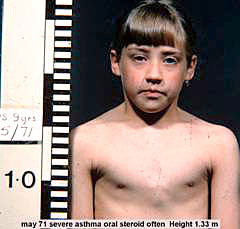 This girl began to wheeze as a baby, and was, treated elsewhere with oral steroids from about age five. She had been on continuous steroids for five years when the first photo was taken, showing the stunted growth, moon face, and obesity typical of steroid dependency. She was successfully transferred to Becotide, and her average peak flow rose from an average 60 L/min to 140, (predicted peak flow was 230). 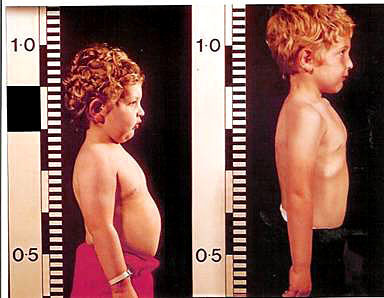 The picture 14 months later shows rapid growth of 8cms and disappearance of the side-effects. She was eventually able to do cross-country running and swimming, but some years later she had to have oral steroids again. All contact has been lost with this case. 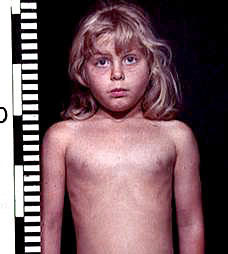 Rachel was aged 6, and a very unstable asthmatic when the photo on the left was taken. 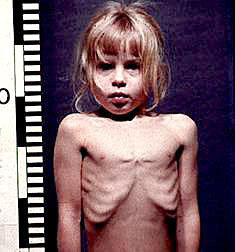 The photo on the right was taken after she had been perfectly controlled with Becotide for nearly two years. The difference in every way is quite remarkable. This group were less severe asthmatics who had not had to be treated with oral steroids except for a flare-up. Older patients were only slightly more likely to have problems in becoming stabilised on Becotide. 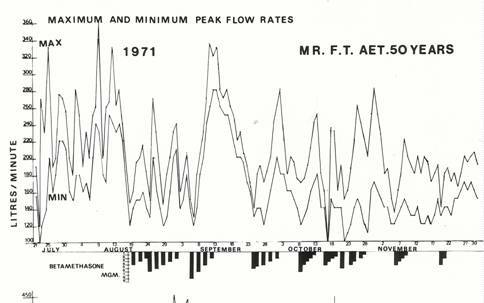 Patients treated with Becotide were all monitored using peak flow meters, the last reviews from my clinic being in 1980. Obviously the cases illustrated here were carefully selected to show dramatic results, but are by no means exceptional. 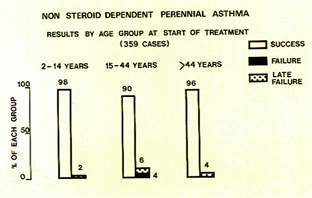 A series of papers from Derby were published from 1971 to 1980, and thousands of studies from investigators all over the world on various aspects of inhaled steroids have been published over the years. The use of aerosol steroids for rhinitis has also been studied in Derby and a survey over a five year period, in which Beconase had been used in 223 patients, showed no long-term side-effects in 534 patient/years of use. Anxiety has lingered over the possibility that long term use would result in adrenal suppression or osteoporosis, especially in post-menopausal women. Several negative studies on this aspect have been published, but have usually been for a few years only. Many patients in the Derby group have been using Becotide for up to forty years. No reports of serious long-term side-effects have surfaced, so it seems most likely that no significant side-effects occur even after so many years, but I have consistently failed to persuade anyone to recall these patients and carry out a comprehensive survey to settle the matter. From about 1968 onwards all allergic patients attending the Derby Chest Clinic had not only the usual case records, but also a punch card system on which brief notes of each consultation were made. Furthermore, all case notes were dictated while the patient was seen and typed, so there is a unique legible record of each case is in existence. When I retired from the NHS in 1982 I was not replaced by anyone with an interest in allergy, and as a result one of the largest allergy clinics in the UK was disbanded and most of the patients referred back to their General Practioners. Some continuity was preserved by the nurse specialist, and the punch card records of the trials carefully preserved, but she has now retired. These punch card records have now been taken over by Nottingham University and it is hoped that the group of patients who were the first in the world to receive inhaled steroids, and have been taking them ever since, will be reviewed This would finally demonstrate if inhaled steroids can be used for life without fear of side-effects or not. One year after transfer to Becotide. 'Slimmer of the year' 1972.